Photo courtesy of Eternal Cavalier Press. The 90s birthed many of the University of Manitoba’s current students as well as huge noise and punk rock bands like Nirvana, Hole, Propagandhi, and Kittens. The latter two emerged from little isolated Winnipeg. Despite producing influential and popular underground rock bands like the aforementioned Propagandhi and Kittens – as well as the Weakerthans, Dead Ranch, and many more – Winnipeg’s alternative rock scene in the 90s has not been the subject of any real comprehensive work. Until now. Over Thanksgiving weekend, I talked to writer and journalist Sheldon Birnie about his upcoming book, Missing Like Teeth: An Oral History of Winnipeg’s Underground 1990-2010, which is set to be released at the Windsor Hotel on Saturday, Oct. 24. Birnie is a local freelance writer and alumnus of the Manitoban. He has written numerous articles on the subject of Winnipeg’s music scene, particularly from the 90s. Suitably, the title of his latest work even references a lyric from one of its prominent subjects, the Weakerthans. According to Birnie, the idea for a book of oral history on Winnipeg’s underground rock scene stemmed from the sheer mass of material on the topic and the uniqueness of the period. Music-centric Canadian publisher Eternal Cavalier Press was interested in the project, as were the subjects of the book. Birnie was able to use Winnipeg’s small size to his advantage. For the most part, he was able to arrange interviews easily either through his own contacts and his contacts’ contacts that he had made over the years of participating in Winnipeg’s interconnected music scene. “With a couple exceptions, people were really keen to share, to talk […] It’s kind of cool that people are still interested in the work that was so important to them back then,” said Birnie. 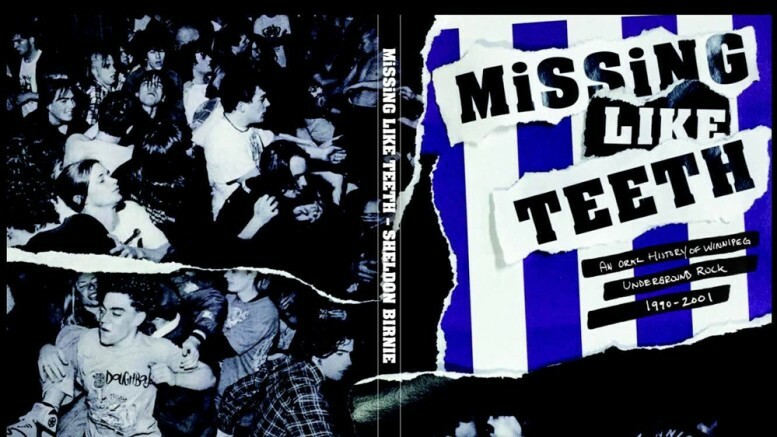 While bands like Propagandhi, the Weakerthans, and Red Fisher – all of whom are featured heavily in Missing Like Teeth – did have commercial success, none of them went into making music with recognition as a goal. “The biggest goal was, y’know, play the Albert and maybe make a seven-incher or a tape. There was no, ‘we’re gonna get on this circuit, we’re gonna get this grant,’ it was to try to do something different,” Birnie said. As we all know, Winnipeg is geographically isolated, and it takes about eight hours to get anywhere. This isolation has been minimized nowadays with the advent of the Internet, and local bands are able to market themselves on a larger scale. Touring and distribution in the 90s was an old-fashioned process that required a lot more time and effort, so for the most part the bands’ priorities lay in the production of music for its own sake and for the local scene. There were also a multitude of all-ages shows in the 90s, particularly at the West End Cultural Centre. These shows allowed kids to get into alternative and underground music before their driver’s licences and later the internet made it accessible to them. While the distribution and touring processes of the 90s music scene may be archaic today, the sound itself is still out there. According to Birnie, even basement and house concerts exist now as much as they did in the 90s. Sheldon Birnie will be discussing Missing Like Teeth at the Winnipeg Anarchist Book Fair at the Millennium Library on Oct. 24 at 5 p.m. His book release party will be held at the Windsor Hotel at 10 p.m. and will feature performances by Johnny Sizzle and Breath Grenades. Cover at the Windsor is $5.